Encounter: Southern bat rays and Thorntail stingrays. These opportunistic rays can be hand fed just inches from shore. Hamelin bay is a popular camping and fishing destination. At the end of the day fishers clean their catches on the remains of an old jetty on the beach. The rays have become accustomed to getting the fish scraps and are prepared to let people pat them in order to get fed. Southern bat rays are tricky to approach when diving so this is a good photo opportunity. The Thorntail rays are massive - almost two meters across and probably hundreds of kilos in weight. Having one of them sucking on your ankle while you're trying to photograph a different one is quite a weird feeling. Operators: Simply show up (preferably on a busy weekend when there are lots of people fishing) and wander down to the shore at the left of the jetty. There's no need to bring any bait as the rays are eager to flap over and sniff around you. 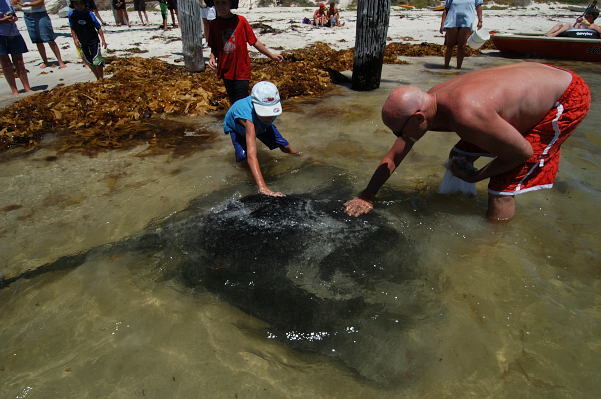 Accommodation: Hamelin Bay has a busy campground that puts you right at the site where the rays come in. Other accommodation such as B&Bs and small hotels are available in the surrounding vineyards and in Margaret River which is a little tourist town catering to people touring wine country. Directions: Margaret river is a three hour drive on the main highway south of Perth. Follow signs to Augusta. Once south of Margaret River head south west towards the coast until you pick up signs for Hamelin Bay. You cant miss it as the road terminates at the boat ramp at Hamelin Bay.